Scoop is a carpooling/ride-sharing service. Basically, I put in when I want to leave and it matches me up with people who want a ride near my work/home. They pay $6 and I get $5 of that per trip. The service in general is greatly appreciated, but the experience leaves much to be desired. Here is my design critique after using the service for a few months (exclusively as a driver, not a rider). I don’t care when I leave; I care when I arrive. If I have a meeting at 9am, that means I need to arrive before 9am. The way Scoop asks the question only allows me to say when I want to leave. Depending on the route, that might make me late. Without carpoolers, my commute is ~40 minutes. The carpool lane saves me about 5 minutes. I am not OK with 30 min “out of the way” tacked on to that. If my setting makes it too difficult, then don’t match me. I don’t want to use the service if it takes me too far out of the way. Right now, I am actively disliking this part of the service. Don’t match me with 2 people unless I opt for that. Seriously, that is messed up. I am signing up for ONE passenger. I get in the carpool lane with one person and I don’t want two. I can’t find anywhere in the app where I can opt for a single passenger. In fact, I see no options of any kind. 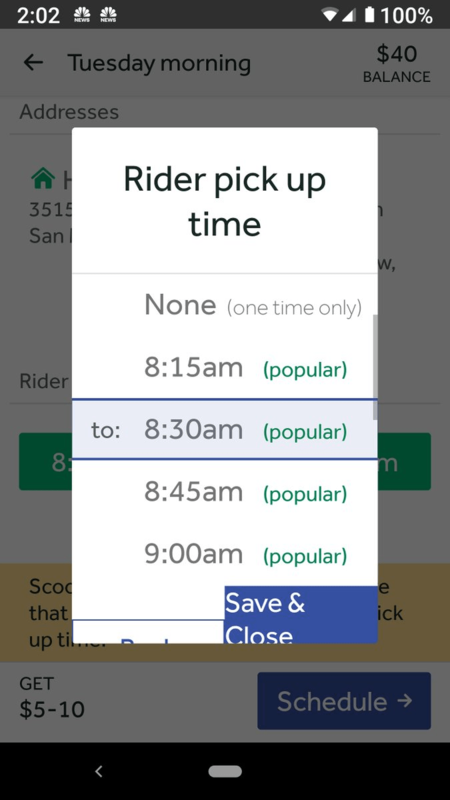 Another option is the ability say, “I want to leave at 8:10”. Not 8-8:15. I dont want to give a range. I want to be specific. As a driver, I should have some more leeway. 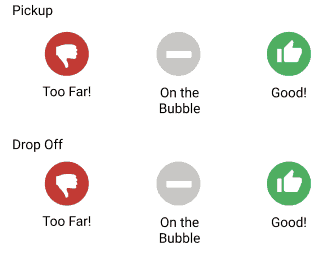 Feedback on the route is not the same thing as feedback on the person. Unfortunately, the way the UI is set up, it’s really complicated to grok. Am I giving feedback on the pickup? On the drop off? On the person? I want to give 1 star to the route and 5 stars to the person. How do I do that? Right now, it is just awful. See the benefit there? I can give useful information to the engineering team to help them match me. Good routes and bad routes have context. Saying 1-5 for the whole thing is just not effective. And the followup questions are hard to get through. Consider a first-come-first option. In other words, at 3pm send me a push notification. I would look at the available riders and choose the one with the right time and distance variables. Let me decide. One could almost imagine a bidding system. I would take a dollar less for someone more convenient. In fact, who cares about the money at all. I’m willing to drive for free if it’s super convenient. (less than 5 minutes total out of my way). Remember, I’m not doing this to make money. I am doing this to be kind to the environment and to get in the carpool lane. Android Auto is how I interact with my phone using Scoop. Specifically, scoop connects to Google maps and then Google maps connects to Android Auto. The biggest problem is the ability to send a message (I’m Outside) from the display. In other words, there is a crucial feature that I can not access from the screen. I can’t let them know I am running late or have arrived. I literally need to park, disconnect my phone, change apps, send the info, change back, reconnect. The whole thing takes forever. It should be a single tap. The Save and Close button one has been annoying me for 2 months. What is taking them so long. It’s right there! Also, I find the app crashes too often and runs pretty slowly. Technical debt is not something you should be OK with. Have fewer features and make the system work faster. What’s the point of the community tab or the stream? I looked inside there and don’t get it. I don’t know what to do with it. Why did engineers spend time on these features? They seem useless. I’m open to being convinced it has value, but be objective about it. Right now, it doesn’t look good. How many drivers/riders are there in the neighborhood over time? I am starting to get annoyed with Scoop. I know Waze Carpool is MUCH MUCH worse, but Scoop is just not giving me a decent experience. Maybe I should buy an electric bike and ride it to CalTrain, take it to the nearby station and ride the rest of the way. The only risk factors are rain and too many bikers on CalTrain. I wish there were more trains at my stops. My critique is not meant to make Scoop designers feel bad. It is to give an unbiased, transparent view of how I use the system. I hope it helps YOU scoop designer/product manager. You know who you are, Samuel. Think out of the Box – the description you laid out is intriguing. I genuinely got a lot out of this approach of critique. Thank you. Glad it was helpful. Not sure what you mean, but still glad.